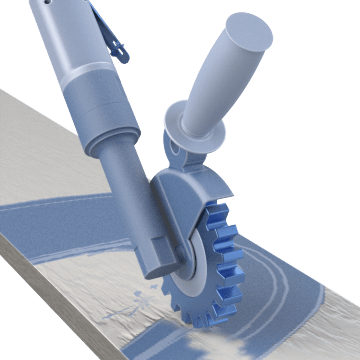 These surface preparation tools use a rotating wheel to remove a variety of surface residues and adhesives from a workpiece. Paint and label removers can be used with serrated eraser or wire wheels depending on the application. Serrated eraser wheels are typically used for removing materials such as pinstriping, double-sided molding tape, and decals. Wire wheels are used for more aggressive paint and rust removal.